Description Correlate a volume with itself. Autocorrelation identifies periodicity in a signal, e.g. air gun bubble, reverberations and multiples. It is useful for detecting repeating periods within signals in the presence of noise. At each lag value, the signal is correlated with a time-shifted copy of itself. 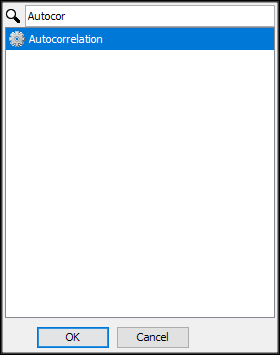 The autocorrelation result is often normalised such that the value at zero lag is 1. Volume: Select the data to autocorrelate. # of lags: The number of correlations (shifts by sample interval) to compute in the autocorrelogram. This includes the zero shift. e.g. "# of lags" = 3 gives an autocorrelogram with lags of 0, 1 and 2 samples). The number of lags determines the output trace length in samples. The zero lag will be at time 0. Normalise: Normalise the result so the zero lag autocorrelation is 1. Start of window: The start time/distance or horizon of the window. 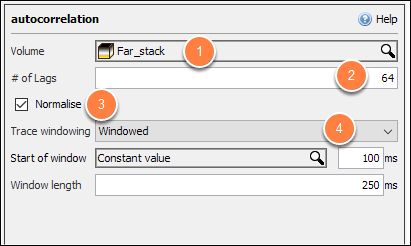 Window Length: The length of the input volume window. Nice example of a strong zero phase event at 0 ms with little noise in the data below. 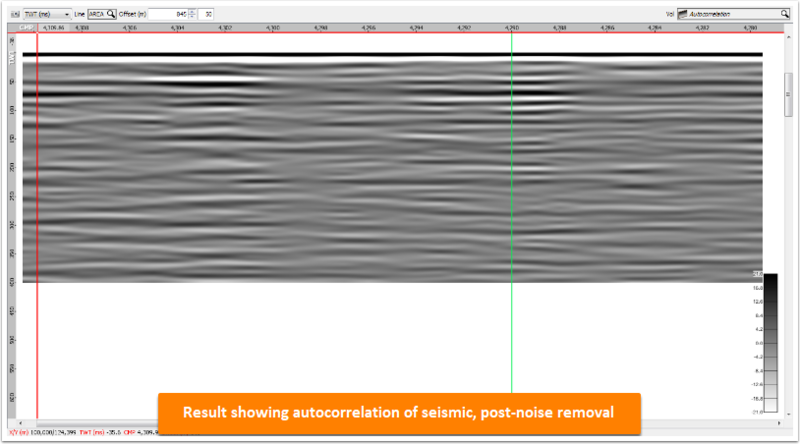 No coherent events below suggesting residual noise was removed.